Electrical supply is the lifeline today whether you are at home or in the office. The dependence on electricity can be equated with breathing!! We cannot do without either of them. In India there is a claimed power shortage; so every city faces power cuts almost all year round. Villages especially face a major problem with load shedding and regular shutdowns for long hours. Whether you live in the city or you have a weekend farm house in the village,Powers cuts don’t spare you. Microtek UPS SEBz 1100va is a great option to continue your daily routine undisturbed due to the electrical power cuts. Microtek is the largest manufacturer of power products in India with eight manufacturing plants for different products. Microtek uses the latest technology and perfectly incorporates it in manufacturing Microtek UPS SEBz 1100va inverters which is designed for better performance and higher reliability. An equipment that ensures power backup without making the humming sound is the Microtek UPS SEBz 1100va. This product is a fantastic innovation from Microtek which beautifully replaces the humming sound caused by other inverters that did not work on the sinewave technology. How Does Microtek UPS SEBz 1100va inverter work? An inverter increases the direct current voltage, changes it to AC before it sends it out to power various devices. The devices are designed to convert AC into DC. Since the converts basically reverse the process to accomplish the opposite effect, they are called inverters. The battery in the inverter is charged from the mains. The Microtek UPS SEBz 1100va inverter converts the direct current (DC) that comes from this battery into alternating current (AC) which is supplied to homes and offices. Old inverters make a buzzing sound. Modern inverters like Microtek UPS SEBz 1100va use oscillator circuits which make them sound free. The alternating current forms sine waves while the output from the inverter is not a perfect sine wave but a square wave. Filtering is required to clean the sine wave, thereby making it non buzzers. 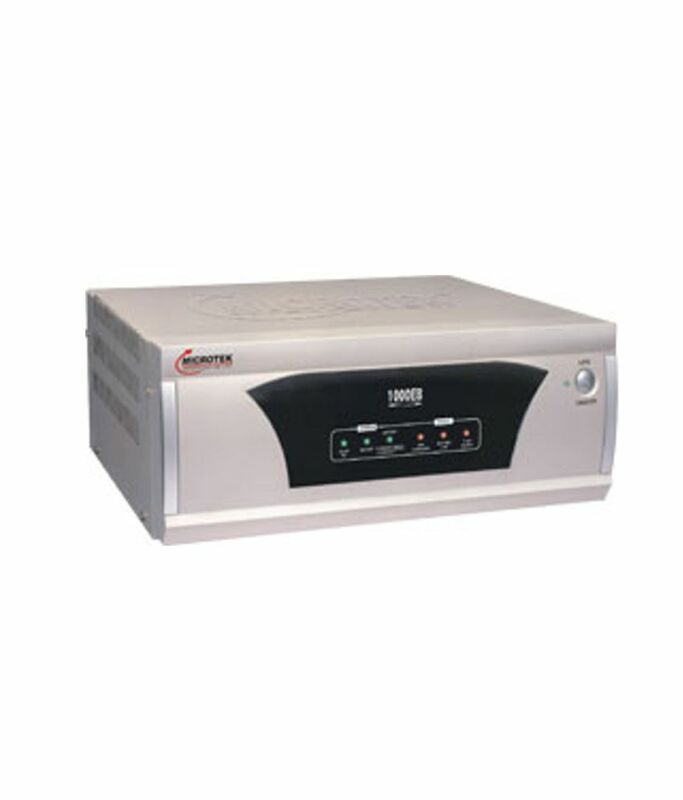 Prices of Microtek UPS SEBz 1100va inverter vary greatly on various portals. Priced at around Rs 7000, check the different online shopping portal where you may find one at a price as low as Rs 4400/-. Invest some time in searching and you may end up saving a lot of money when you buy Microtek UPS SEBz 1100va. Microtek UPS SEBz 1100va inverter comes with a two year warranty. The service centers are spread out all over the country which ensures excellent service backup. With microtek inverter you are sure you will never be without a power supply even if there is a shut down in your city or area. It is easy to install this inverter. Either follow the instruction or let the microtek expert come and do the installation which hardly takes any time. With intelligent controls, display indicators and the high end technology that is used to give you a silent performance, Microtek UP SEBz 1100 VA is a great buy today. Remember that due to changes in technology and continuous improvement of the product, the specification are bound to change without notice. To power your computer or television along with the lights and fans in the house, Microtek UPS SEBz 1100va inverter is recommended. To Recieve updates and possible rewards for Microtek UPS SEBz 1100VA please sign in. To Recieve updates and possible rewards for UPS & Inverter please sign in.